Owen has always been indifferent about the whole idea of a little brother. 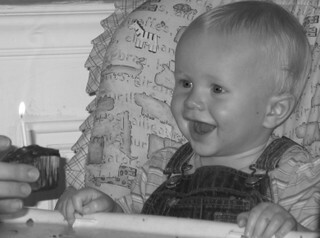 When we brought Ethan home from the hospital, he just shrugged it off as an everyday event. Owen complained about all the noise that a baby makes and didn't like the idea of sharing "mommy time". 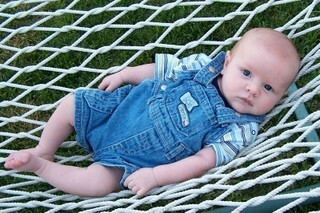 When Ethan became mobile, Owen was very sensitive to the idea of somebody else playing with his toys. So the past year has been a hard transition for Owen, to say the least. Today was a turning point of sorts. I was in my bedroom folding laundry (I promise that not ALL of my posts will refer to laundry, but it does seem like I'm always doing the ongoing chore!!!) and heard giggling from BOTH boys at my feet. 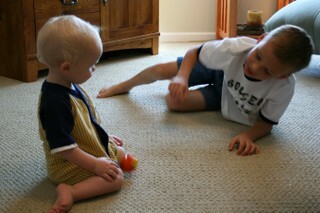 I glanced down and saw Owen throwing a ball to Ethan, and then Ethan rolling it back. 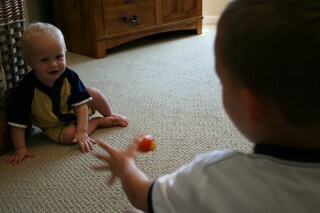 Ethan thought it was funny to see the ball rolling and Owen thought it was funny to hear Ethan laugh. An ongoing cycle of giggles was taking place between the two brothers. Needless to say, it made me smile. My little blessing of the day; captured. A friend of ours asked me to make birthday invitations in honor of her daughter's fourteenth birthday. My only restriction was to use pink or purple. How fun is that! So I ended up digging out one of my new favorite stamp sets, Kate's Shapes from Fontwerks. I used Pixie Pink & Pretty in Pink inks from SU! along with the stamps to create my patterned paper. In designing my project, I figured out a unique way to layer the cardstock so the card looks finished inside and out. 1. Start with three pieces of cardstock. 2. 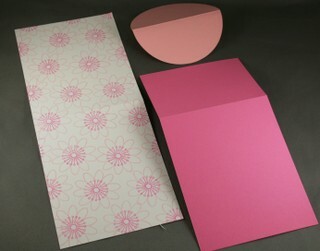 Adhere the dark pink cardstock to the interior of the white card base. Be sure to line up the edge of the dark pink with the score line on the white. 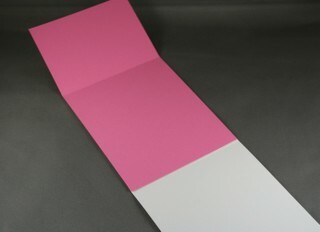 A 3-inch flap of dark pink will extend past the end of the white card base. 3. 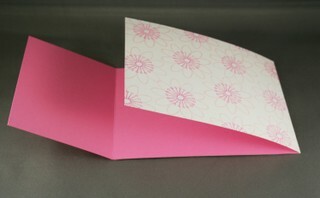 Fold dark pink flap over edge of white card base. 4. 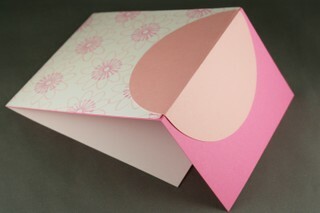 Adhere pink circle over flap of card. Line up the score lines of both pieces when adhering. 5. 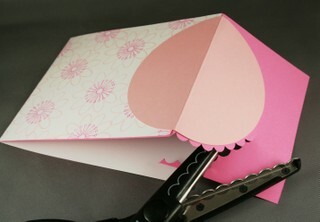 Trim the dark pink cardstock that extends past the edge of the light pink circle with scalloped scissors. 6. Viola. Finished project, lined in dark pink with no awkward seams! BTW, the cute little plastic flowers I used are from the Emily Greenhouse Premier collection by American Crafts. They are a nice change from the over-used primas sometimes, and have a little bit of a cleaner look to them. ETA: You can use the Basic Grey magnets to keep the flap closed! This type of fastener also makes it FUN to open! I recieved the most wonderful email from little 8 year-old Faith Montgomery a few weeks ago. She thought that there ought to be a water droplet stamp in the Green Thumb collection so she could make the watering can "water". I challenged her to get creative and see what she could come up with. To my surprise, I got the most BEAUTIFUL card emailed to me today along with a very clever solution to her quandary. She used the small leaf stamp and colored in the "vein" with a marker to change the image into a water droplet. I was so impressed at both her talent and creativity, I promised I would display her artwork on my blog. Way to go, Faith! I'm so proud of you! It still astounds me how unbelievably fast time goes by. A year in the life of a baby is such a magical event, almost a fairytale. They start out so small, their limbs curled up against their body. Their eyes closed in a peaceful sleep more often than awake. You know them so well, but at the same time they are a stranger. The itty bitty diapers. The soft fuzzy hair and tightly clenched fists. And then in the blink of an eye; they become mobile and independent. Their personality begins to form, likes and dislikes. You learn all about them and who they really are. What type of person they are growing into. My most vivid memory of the first few weeks with Ethan involved doing laundry. I remember it was the first time I had done the task myself since we had returned home from the hospital. 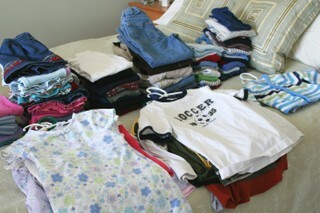 Our laundry room is right next to our master bedroom, so I have always folded all of the clothes on our bed. I had a routine established. Hannah & Owen each had a pile for pj's, a pile for pants and then shirts were placed on hangers and laid flat in front of their respective piles. I had already folded and hung a few things of theirs from that particular load, when I came to one of Ethan's onesies. I remember just glowing from ear to ear, smiling to myself. I had to start a new set of piles. So, as I was doing laundry this morning, I had the luxury of revisiting this moment. The three sets of piles for three very individual kids. The size of the clothing in the third set seems to increase with every month, as Ethan grows and changes into a toddler. I know the next year will go by just as fast. But at least that third pile of laundry will be around, even when the diapers & bottles are gone. Happy Birthday, Ethan Alexander! Paper Crafts magazine has really been working hard to revamp their website and has some fun things you may want to check out! Their blog is updated regularly and we all take turns posting interesting tidbits about our personal lives and the industry. Right now you can try your hand at winning an Ellison Tote for die-cut storage! 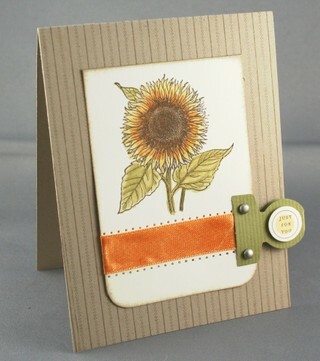 There is a new Simple Sentiments section that lists unique sentiments for cards, separated by category. I think this is a fantastic resource that I will turn to again and again! 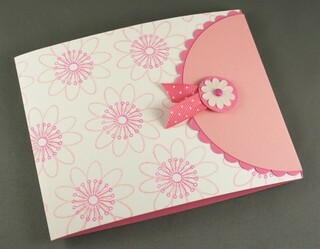 Paper Crafts website also hosts one of the biggest swap boards around! Check this list out. Members are updating it regularly! There are so many types and themes of swaps going on, it is hard to pick just one to participate in! And you never no when you might get to swap with Stacy or one of the Pros! We pop on there about once a month and host a swap of our own! 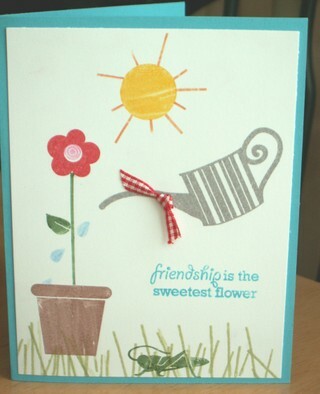 This is a card I made for a swap I just hosted called Spring Showers & Flowers where everyone utilized floral stamps and a watercoloring technique. (As a side note, I discovered that the Circle of Friendship images from SU! can fit this round tab punch from McGill by just using the center of the images in conjunction with a 5/8" circle punch. 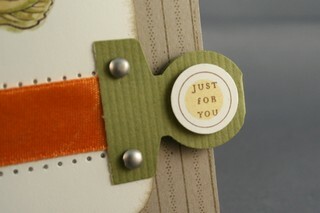 I also stamped a "dot" from Butterfly Kisses in the center to help tie in my accent color). Check out their free downloads as well. They are so fun and make it quick & easy to put together something really unique! While referencing the magazine I thought I would also link you up to the fabulous felt resource I found while creating for the PC101 column in the April/May issue of Paper Crafts magazine! The company is called Artgirlz and they carry a plethora of unique "artsy" supplies that could be used for paper crafting and other hobbies. Their felt is the best quality I have found because of it's density and it comes in SO many pretty colors!